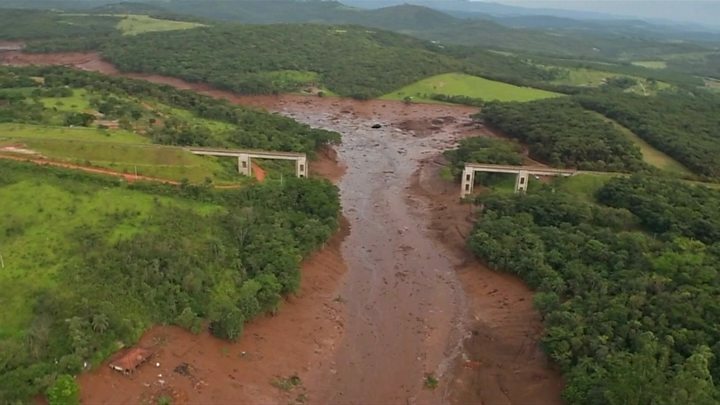 Senior Brazilian politicians have called for Vale SA to be held to account for last week's dam disaster, as anger grows towards the mining firm. Brazil's Vice-President Hamilton Mourão said those to blame should be punished, and a top prosecutor said executives could be held personally responsible. Vale, which owns the complex, says safety procedures were followed. Firefighters say 60 people are now confirmed dead after a sea of mud engulfed a canteen and nearby houses. Some 192 people have been rescued near the south-eastern town of Brumadinho but nearly 300 are still missing. Rescuers say they are very unlikely to find more survivors. The cause of the dam burst remains unclear. Shares in Vale, the world's largest iron ore producer, fell by more than 20% on the Sao Paulo stock exchange on Monday. Search operations were suspended for hours on Sunday amid fears that a separate dam, also owned by Vale, was at risk of giving way in the area. What is being said about Vale? Vice-President Hamilton Mourão, who is standing in for President Jair Bolsonaro as he undergoes surgery, said the government would need to investigate and punish those found responsible for the disaster. He added that the government would set up a working group to look at the company's management. "If there was malpractice, recklessness or negligence on the part of someone inside the company, that person has to answer criminally," O Globo website quoted him as saying. Meanwhile top prosecutor Raquel Dodge said it was important to hold the company "strongly responsible". The mayor of the state capital Belo Horizonte, Alexandre Kalil, said "Vale's board of directors should be in jail". The comments came after state prosecutors said they had frozen a total of 11bn reais ($2.9bn; £2.2bn) of assets belonging to Vale. Brumadinho Mayor Avimar de Melo Barcelos has also criticised authorities in the state of Minas Gerais, which he blamed for poor oversight. Vale president Fabio Schvartsman said the company had followed safety recommendations by international experts. "I followed the technicians' advice and you see what happened. It didn't work," he said in a TV interview. Mr Schvartsman promised "to go above and beyond any national or international standards... We'll create a cushion of safety far superior to what we have today to guarantee this never happens again." A statement by the company on Sunday said the dam had passed stability tests in June and September of last year. It reiterated that safety at the site had been in accordance with international best practice. The company also says it has suspended payouts to shareholders and executive bonuses. What is the latest on the search effort? Firefighters said 292 employees, contractors and residents were still missing. So far 19 of the 60 dead have been identified. The chances of pulling any survivors from the mud are now very low, said Lieutenant Pedro Aihara, the spokesman for the rescue operations in Brumadinho. "It's very difficult for us to deal with the pain of the relatives and their anxiety," he said. "But you may rest assured that we are doing all we can, as though we were looking for our own parents." The dam break caused a sea of muddy sludge to bury the site's cafeteria where workers were eating lunch, before engulfing nearby houses, vehicles and roads. Access to the areas is difficult - in some places, the mud is up to 15m (49ft) deep. Search teams have been using helicopters and earth-moving machinery. "I still have hope," Nélia Mary Fonseca told the BBC as she waited for details about her husband, Adriano, who worked as a contractor at the site. An Israeli group of engineers, doctors and members of the navy's underwater missions unit has joined the efforts. Has this kind of thing happened before? 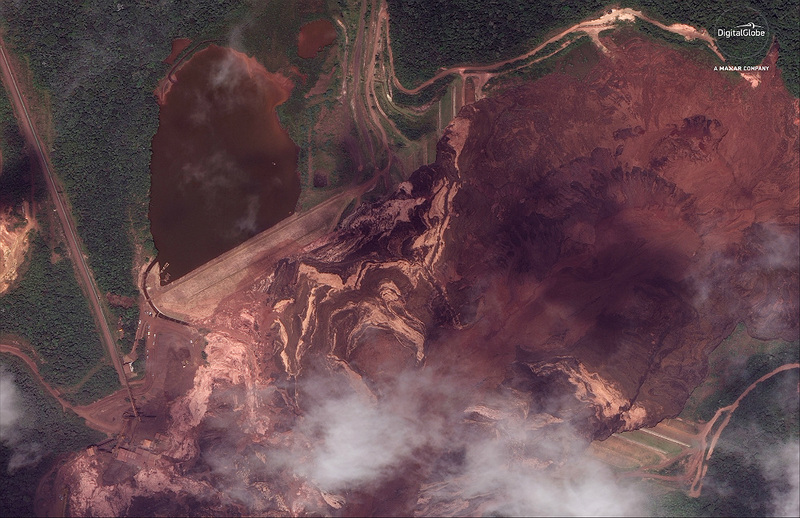 Unlike dams used for water, tailings dams - like that in Brumadinho - are used to store by-products from mining operations. There have been a number of high-profile disasters involving tailings dams in recent years - and there have been calls, including from the UN, to institute better safety and building regulations around them. 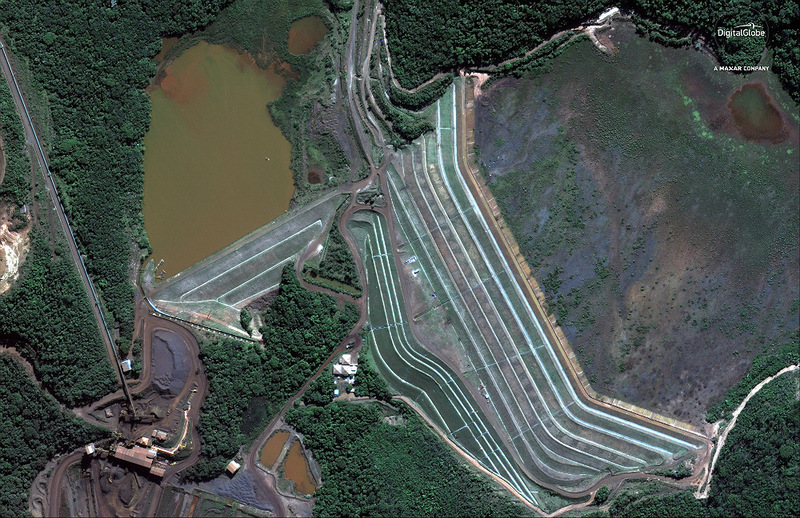 In November 2015, a dam owned by Vale, along with BHP Billiton, burst in Mariana, also in Minas Gerais. It killed 19 people in what was considered Brazil's worst environmental disaster at the time. After a lengthy court case, the companies reached a settlement worth at least 6.8bn reais ($1.8bn) with the Brazilian government.